Randy C. Roberts is a 2013 graduate of the PhD Program in Leadership and Change at Antioch University. Below: Dr. Roberts at her Dissertation Defense. 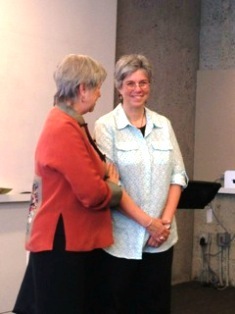 [ Right] with her Dissertation Chair, Dr. Carolyn Kenny [Left]. Roberts, Randy C., "Museums as Sites of "Being in Conversation": A Hermeneutic Phenomenological Study" (2013). Dissertations & Theses. 54.